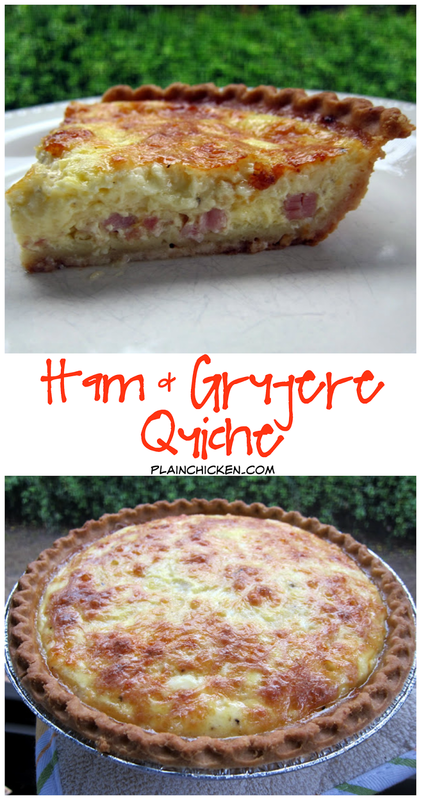 Ham and Gruyere Quiche - eggs, milk, sour cream ham, gruyere cheese - can assemble & freeze for later! SO good! We love it for breakfast, lunch or dinner. Believe it or not, Chicken Legs is a huge quiche fan. I haven't made one in a while, so I thought this was the perfect way to use up the last bit of our Easter ham. This quiche was amazing! It was light and fluffy and wonderfully creamy. Chicken Legs said he could have eaten the whole thing himself. Don't worry - he didn't. We had some leftover for lunch the next day and it was even better! Chicken Legs has requested that I make two quiches next time so we have plenty of leftovers. Bake the unfilled pie crust for 8-9 minutes. Remove from oven. Place chopped ham in bottom of pie crust. Top with cheese. Whisk together eggs, milk, sour cream and pepper. Pour over ham and cheese. Great recipe and easy. The quiche looks so good! I really love ham and gruyere together. This looks like a winner! I made ham soup, now I will make ham quiche and see if the Ex-Ex likes it! I just happen to have some gruyère in the frigo at home. I don't know why the whole "real men don't eat quiche" thing even started. It's absurd -- who doesn't love Bacon and Egg Pie !? No one. Looks great! I just have to say that you really are my hero!! I love that you work all day and then come home and put together interesting and fun meals for the rest of us to read and drool over!! It totally sparks my creativity in the kitchen and makes me happy just to think about what may come out of the oven next! THANK YOU!!! 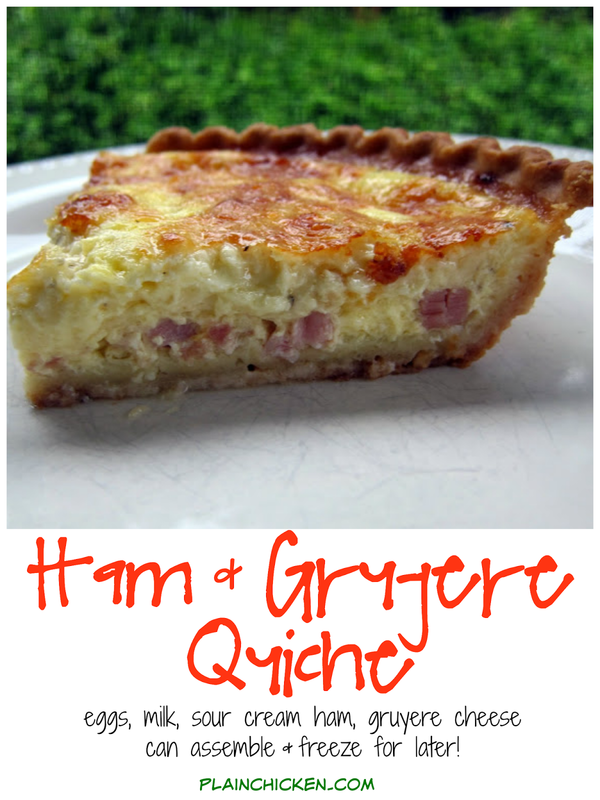 And oh yeah... BTW- LOVE QUICHE! It's perfectly gorgeous! So gorgeous, that'd you wouldn't want to cut into it. WRONG!!! Wish my fork could scoop a mouthful right about now. Real men like quiche, especially when it looks this good and I'm with him on the leftovers. I could eat just about anything with gruyere in or on it. Except fish. what kind of pepper do you use? Angela - I used black pepper. I didn't have Gruyere Cheese but I HAD to have this today! So I used what I had, which was alittle shredded Queso cheese, alittle Mozzarella, and alittle grated Parmesan Cheese instead. YUMM!! You really can't go wrong using this recipe, thanks for sharing it!